A range of photos are available from Library and Archives Canada here. 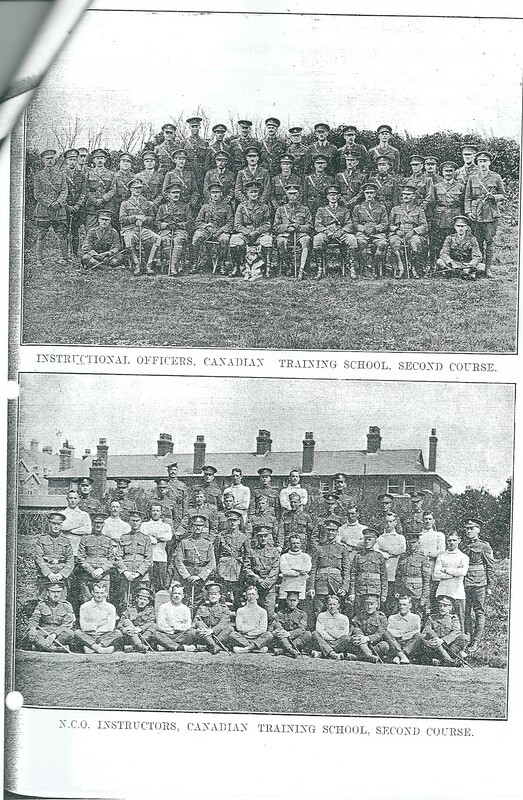 A blog post, written on 28 February 2013, which gives a brief analysis of the photos and situates them in the context of how the operations at Bexhill fitted within the Canadian wartime experience can be accessed here. Duke of Connaught photos taken from “Chevrons to Stars: Official Organ of the Canadian Training School Bexhill.” October 1917.” Available from Library and Archives Canada, RG9-III, Vol 5078. 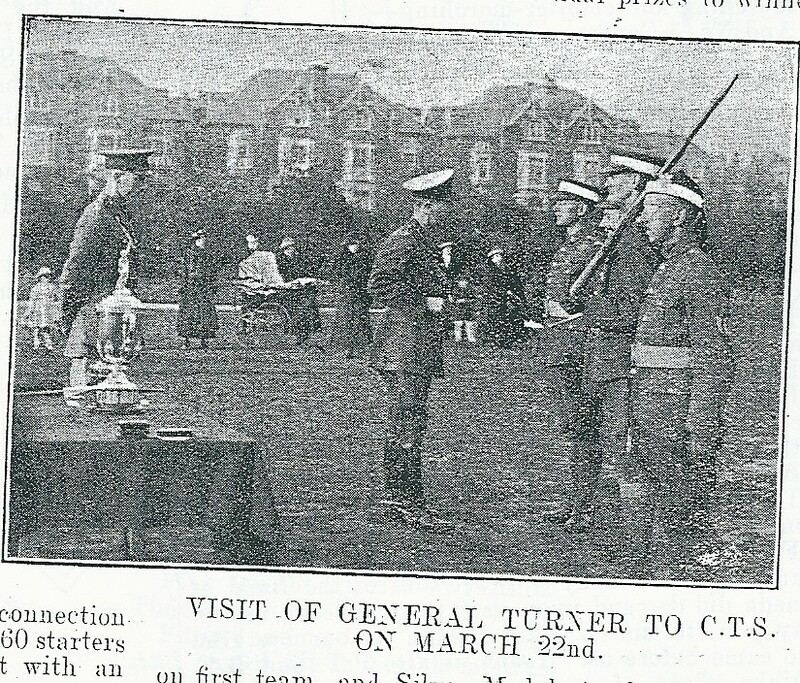 Chevrons to Stars, April 1918. 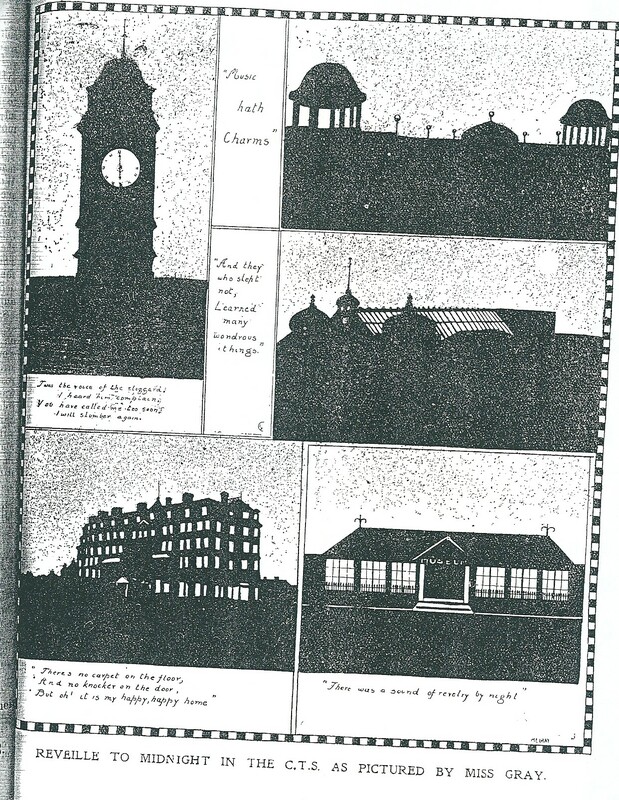 There are some interesting cartoons and drawing contained within the Canadian magazines which depict the landmarks of Bexhill and how the Canadians interacted with the local inhabitants of the town. Below are two examples. The latter example shows some key landmarks of Bexhill, some of which remain today like the Clock Tower and Collonade and others which are sadly no longer standing, such as the Metropole Hotel and the Kursaal (later the Bexhill Pavillion). 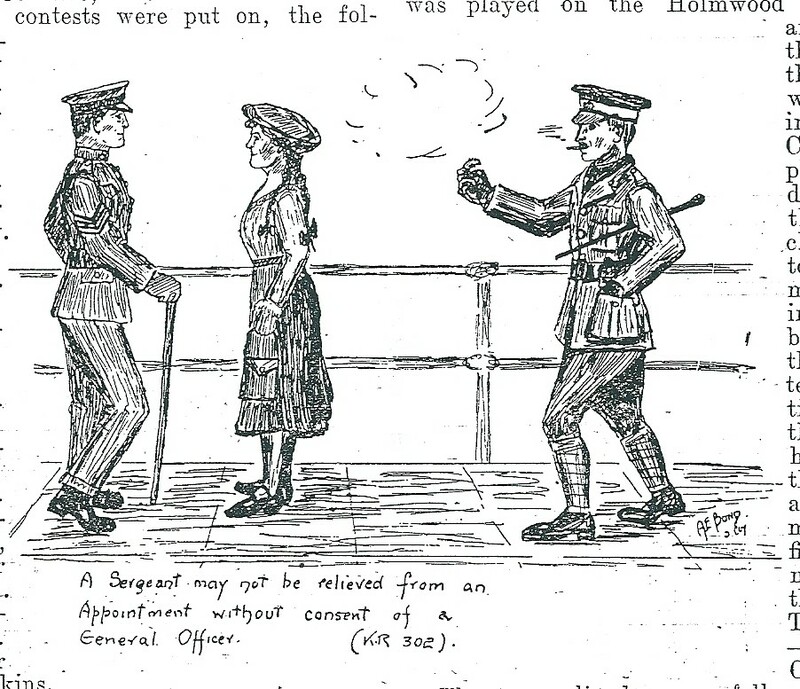 The former cartoon is a humorous insight into some of Bexhill’s ‘distractions.’ Yet, it underscores a very real phenomenon of the First World War. 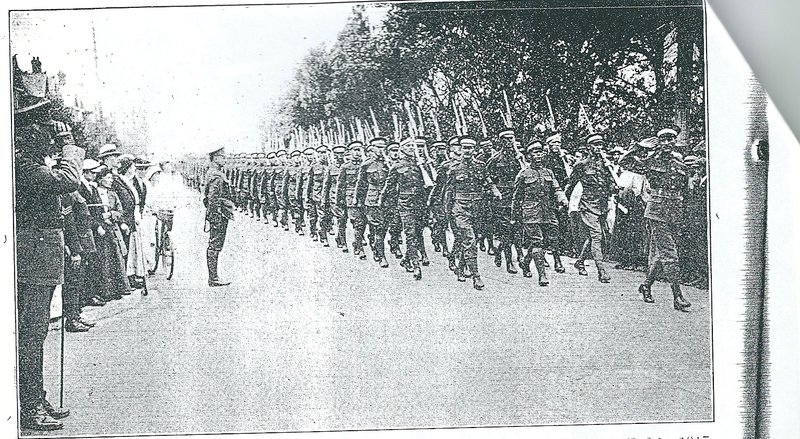 It was estimated that 20 per cent of Canadian soldiers would bring back British born women to Canada at the conclusion of the war. Bexhill-on-Sea was described as a ‘matchmakers’ paradise.’ (Toronto Daily Star, 12 November 1917: 13). 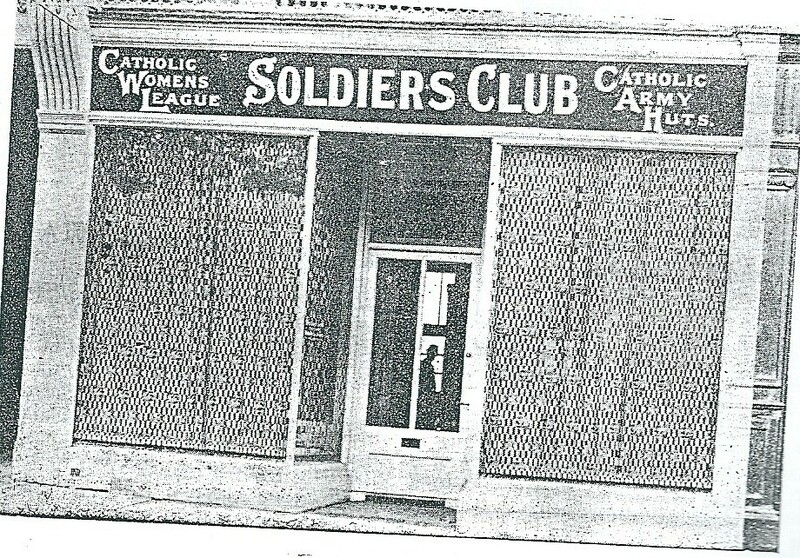 Princess Pats Post, July 1918. 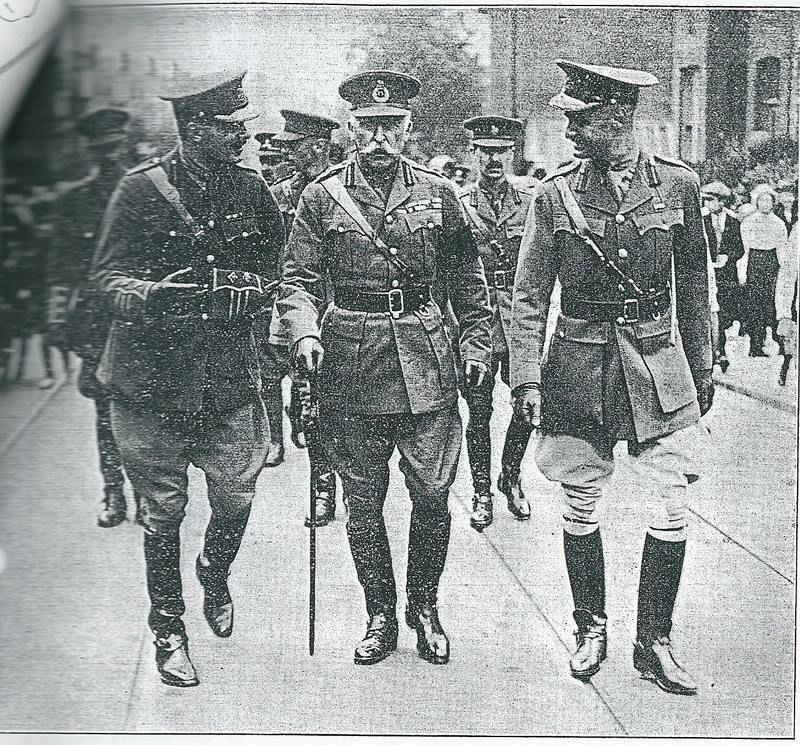 Princess Pats Post, August 1918. 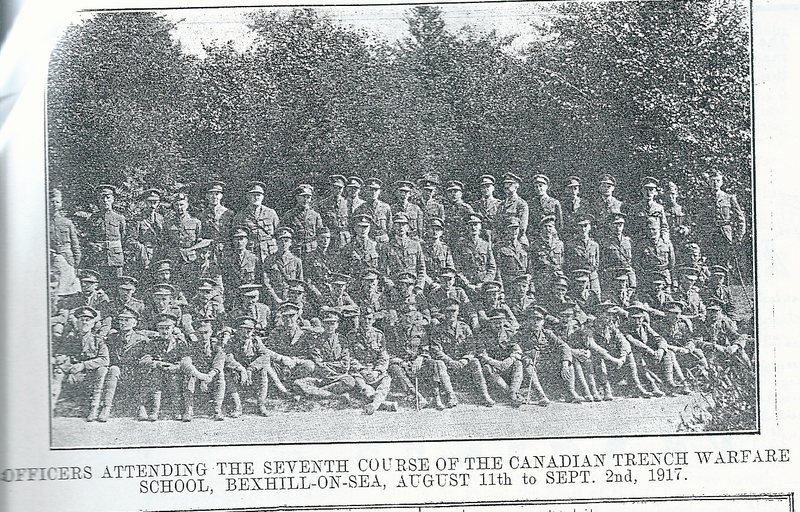 Below is a photo of the participants of the Seventh Course of the Canadian Trench Warfare School, Bexhill held between 11 August and 2nd September 1918. 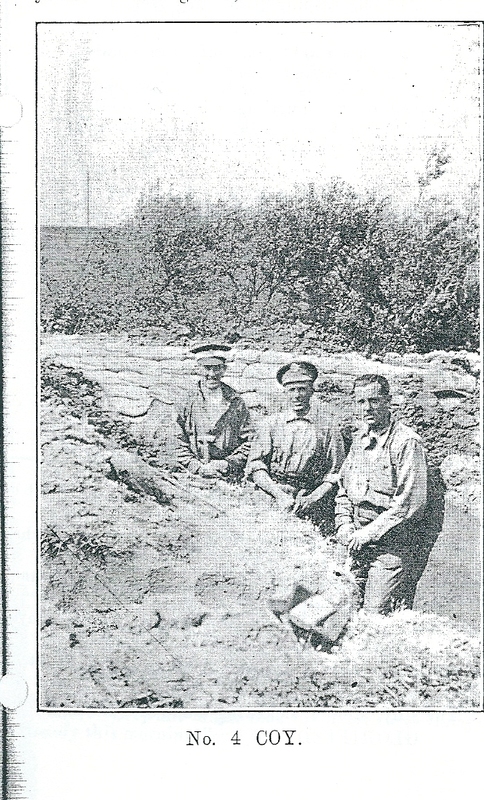 Canadian Trench Warfare photos taken from “Chevrons to Stars: Official Organ of the Canadian Training School Bexhill.” October 1917.” Available from Library and Archives Canada, RG9-III, Vol 5078. 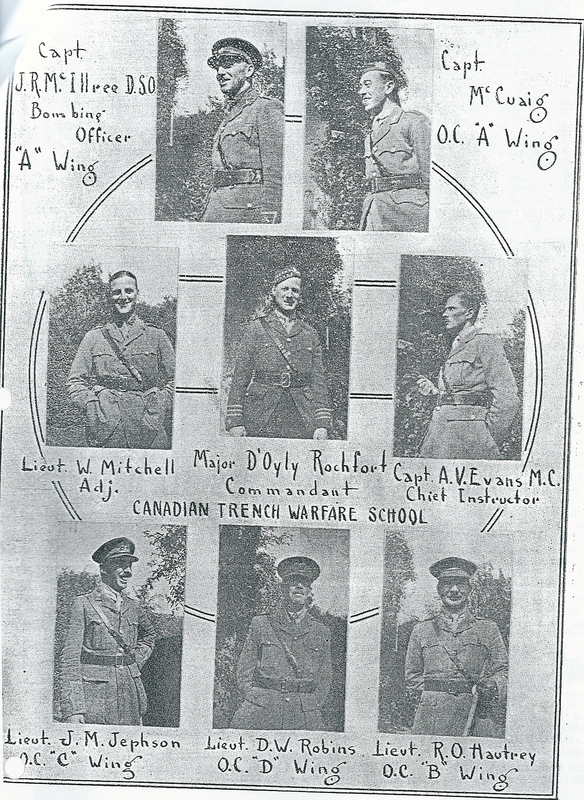 Chevrons to Stars, June 1917. 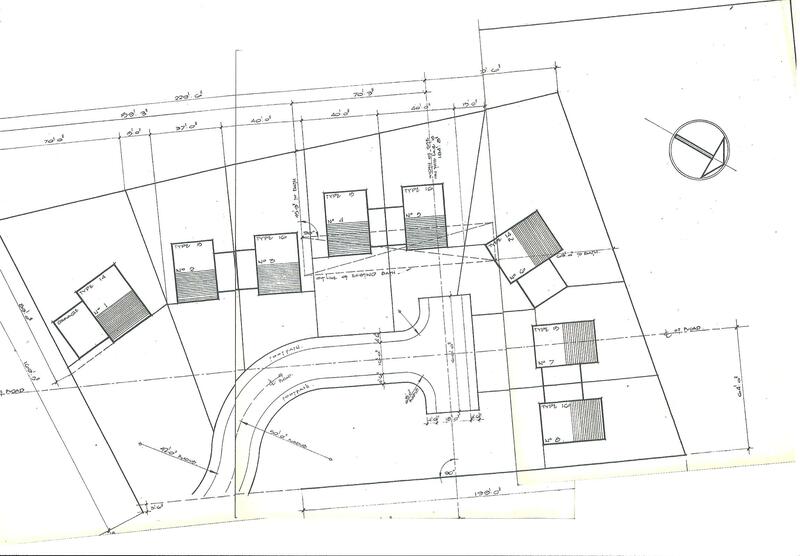 Below is an architectural drawing of a proposed development of regency houses on Cooden Close in the 1960s. The houses, which are still there today, were built by Parker & Cole in 1964 on land that was once the site of the Cooden Camp, home of the Canadians during the First World War (WWI). The interesting anecdote about this drawing relates to the rectangular box across houses 4, 5, and 6. I have marked this out more clearly on the second drawing. 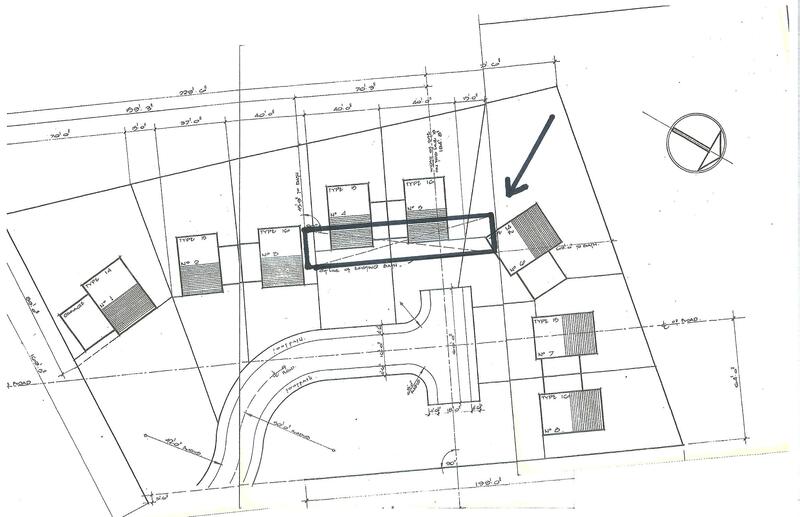 The rectangular box shows a swimming pool constructed by the Canadians during WWI which disrupted the development and led to the reconfiguration of the foundations for the affected houses. I am told by Peter Cole, whose company built the houses and who kindly supplied the drawing, that the construction equipment could not penetrate the pool in order for it to be filled in. The foundations were therefore modified and the houses built on top of the pool. I found this to be a fascinating story of how the Canadians left an unintended legacy in Bexhill. Peter Cole is Vice-President of the Bexhill Hanovarian Study Group (BHSG), a group committed to the study of the Kings German Legion in Bexhill. For more on the BHSG please click here. Below is a map of Bexhill circa 1940. 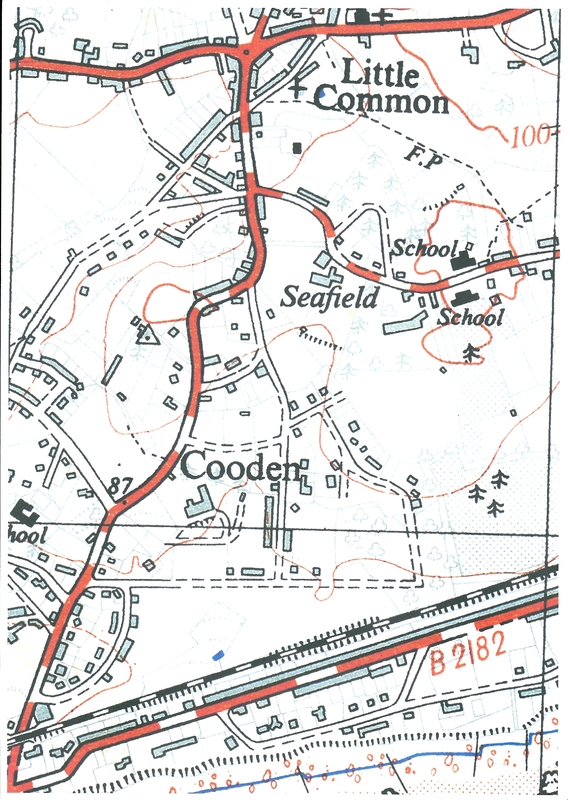 The map clearly shows the Cooden area, where the Canadians were based during the First World War. 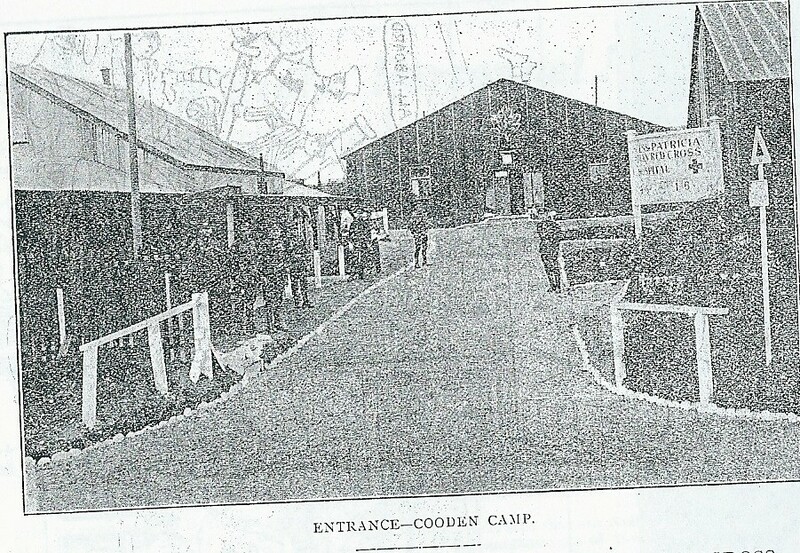 The specific parameters of the camp are not outlined but it gives an idea of the general Cooden area. The area marked Seafield, refers to Seafield school on present day Collington Lane West where Canadian soldiers were based during the Second World War. Again, thank you to Peter Cole for supplying this map. 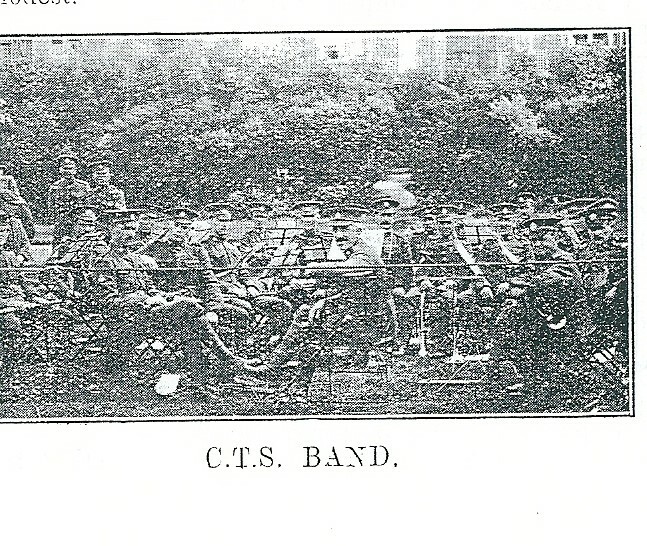 Below are various sports photos from the C.T.S. 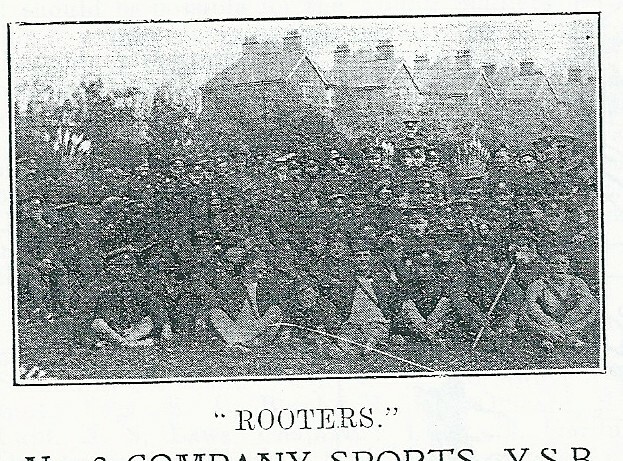 The term ‘rooters’ refers to supporters of the sportsmen. 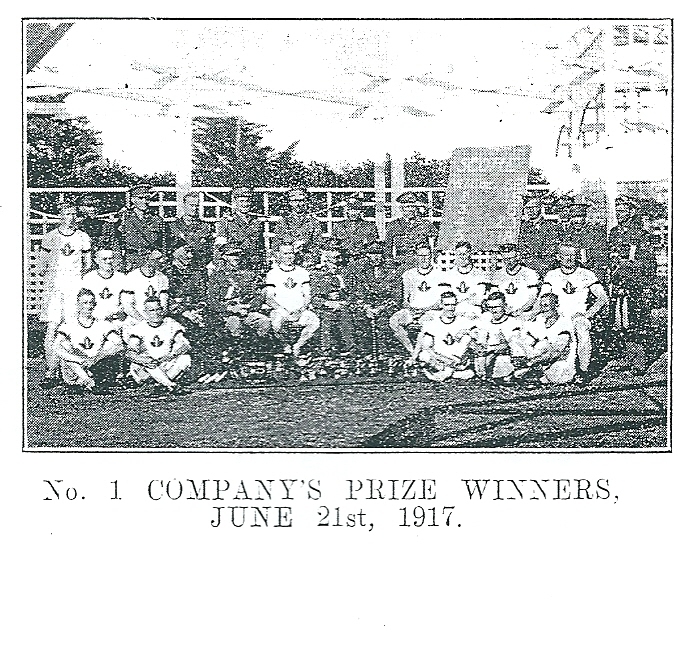 It was noted that quite a few locals became rooters of the Canadian sports teams. The two photos directly below are interesting for the way that they show the distinctive houses that surround Egerton Park. 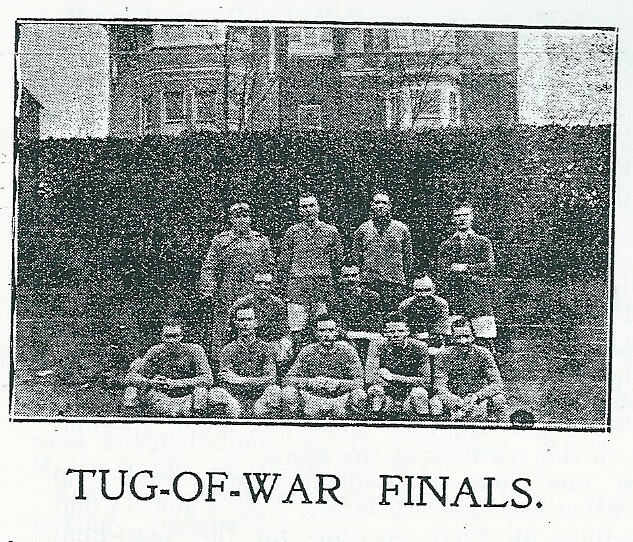 Below are two photos depicting the sports that were played by the Canadians during their time in Bexhill. 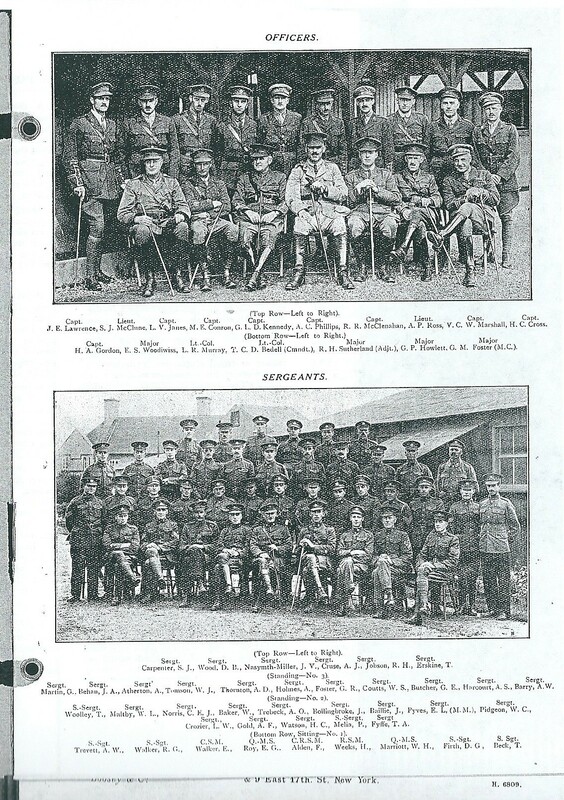 Both these photos are available online from Library and Archives Canada.